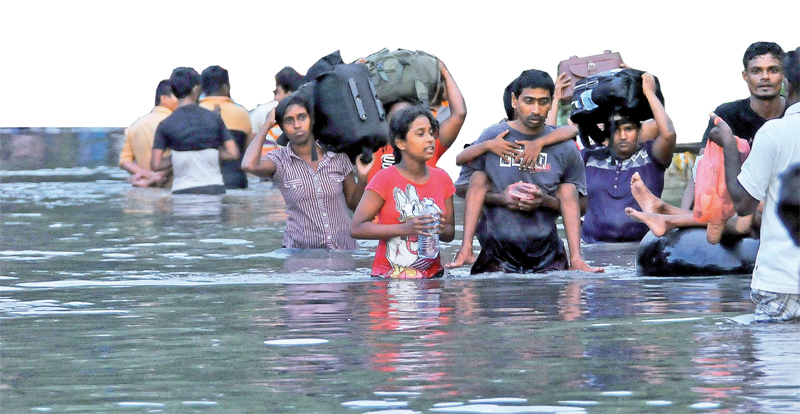 The Tri Forces jointly with Disaster Management Center personnel yesterday launched a massive operation in Kolonnawa, Wellampitiya and Kelaniya areas to rescue over 20,000 people trapped in major floods to hit the area in 25 years. The number of deaths caused by the inclement weather conditions have risen by four. The toll now stands at 58, Disaster Management Center (DMC) sources said. The number of missing persons now stands at 15 while 28 persons have been injured. Security Forces and Police personnel deployed hundreds of boats to rescue them from houses from yesterday morning as water levels kept on increasing. The military personnel involved in the rescue missions had to forcibly evacuated those who refused to move from their homes as they have had the bad experience of losing their belongings during the floods in 1992. Speaking to the “Daily News” DMC Media Spokesman Pradeep Kodippili said that they have informed the people living in the low lands on the banks of the Kelani River and Kolonnawa area to be vigilant of floods throughout the last four days. “We warned them to leave their homes and move to safe places before they get trapped in the floods. Accordingly 94151 persons from 18756 families in Kolonnawa and 28178 people from 6940 families in Kelaniya have left their homes so far and settled in 41 safe centers”. “But, around 15, 000 persons had refused to leave their homes as they were afraid of loing their possessions . Finally we had to evacuate them to safe centers in the wake of the fast rising water level of the Kelani river. So with the assistance of all three forces we brought them to the safe locations”, Kodippili said . The number of deaths caused by the inclement weather conditions have risen by four and now the toll stands at 43, Disaster Management Center (DMC) sources said. Accordingly the number of missing persons has decreased to 15 and 28 persons have been injured. Presently, more than 300 army troops along with 40 officers belonging to the 58 Division (4 Sri Lanka Sinha Regiment and 8 Vijaybahu Infantry Regiment) and Commandos are engaged in rescue and relief operations and more than 53 troops of the Sri Lanka National Guard are also presently engaged in relief operations. They are mainly engaged in the rescue operations in Aranayaka and Bulathkohupitiya which were badly affected by landslides. They found nine dead bodies buried in the landslides in Kalupahana, Bulathkohupitiya during their search operations. There were eight female bodies and one male body. However, the operations are being hampered owing to bad weather. Wellampitiya, Kollonnawa, Biyagama, Kotikawatta, Vavunia, Wilachchiya and Mandagalaru. Sri Lanka Navy Media Spokesman Captain Alavi Akram said that ten more flood relief teams are kept on standby covering all the areas affected by floods to meet any emergency situation. Meanwhile, Sri Lanka Air Force (SLAF) was engaged in another operation dropping dry rations and cooked meals to the flood victims . They have dropped dry rations in Biyagama BOI Zone and distributed lunch packets in Dompe. In addition the SLAF has initiated a flood relief goods collection center at the Rifle Green Pavilion, SLAF Station Colombo to handover donations. They requested the public who are willing to assist to hand over flood relief items including food and clothing to the center located at Sir Chittampalam Gardiner Mawatha. The public can obtain more details on 0113133105. One of the highest rainfalls in the country was recorded during the last four days, the Meteorology Department said yesterday. The rainfall of 440.2 mm recorded in Colombo in 2010 and a rainfall of 493.92 mm also recorded in Colombo in 1992 are the top rainfalls recorded in the country until the present downpour . Duty Meteorologist Buddika Banduratne said the highest rainfall received during the last 24 hours ended on Wednesday morning at 8.30 a.m was reported from Kalepitimulla, Gampaha. “The rainfall was 135mm,” he said.